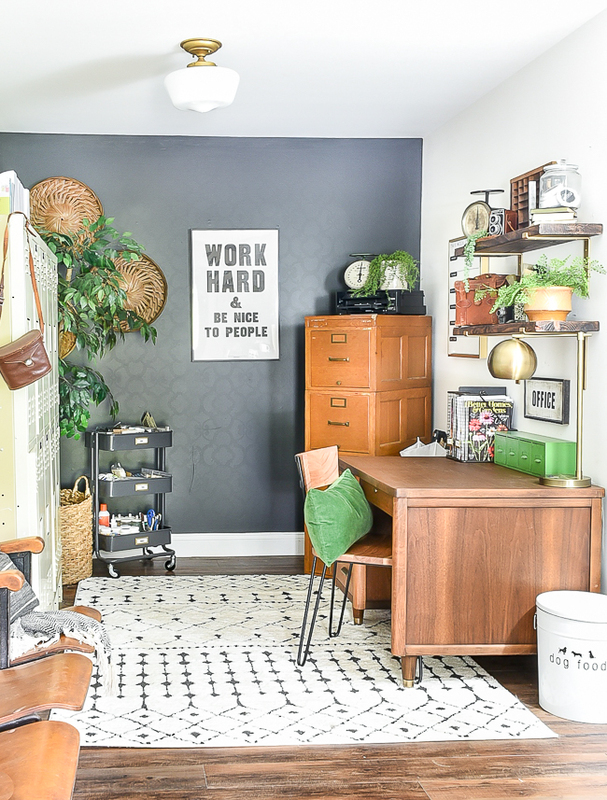 A small home office makeover packed with lots of contrast and vintage style! This post is sponsored by Crates and pallet. Almost two years ago, I shared my modern industrial farmhouse office. Since then, I made a few changes including refinishing an oak chest and adding a set of 5 vintage theatre chairs to the space. I LOVED the changes and had no plans of redecorating, but then I stumbled upon the perfect mid-century desk at Goodwill for $14. 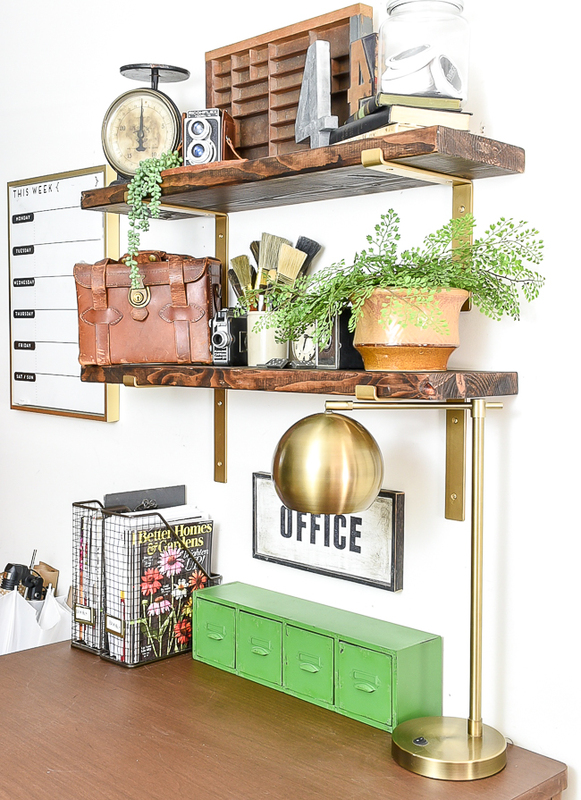 I knew it HAD to come home with me, which ended up sparking a little vintage office makeover. 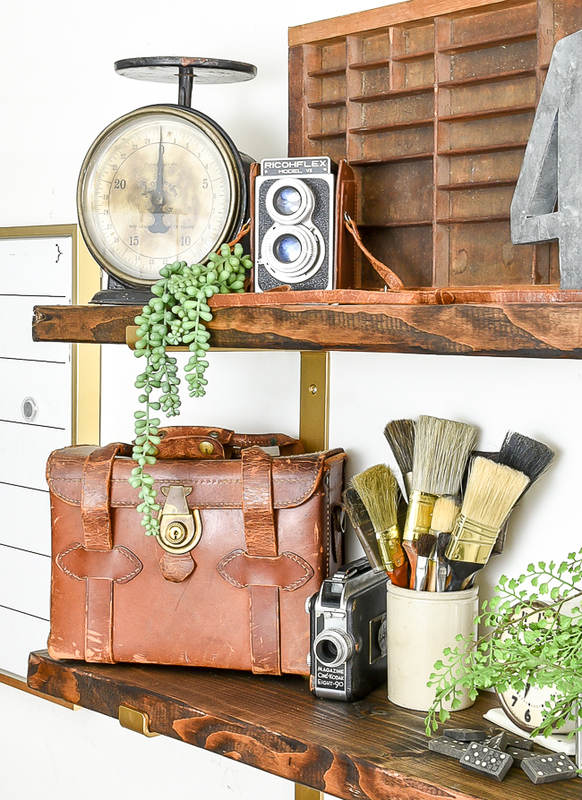 I moved the oak chest to my shop at Sweet Clover Barn and moved in a set of vintage lawyer file drawers (found on Facebook Marketplace), a new rug, DIY wood shelves and lots of my favorite vintage decor. Let's talk about the amazing shelves first. I love hunting for unique vintage finds and especially love old alarm clocks and cameras, but never really had a place to display them. I knew having shelves above my desk would be the perfect place for all my favorite finds. 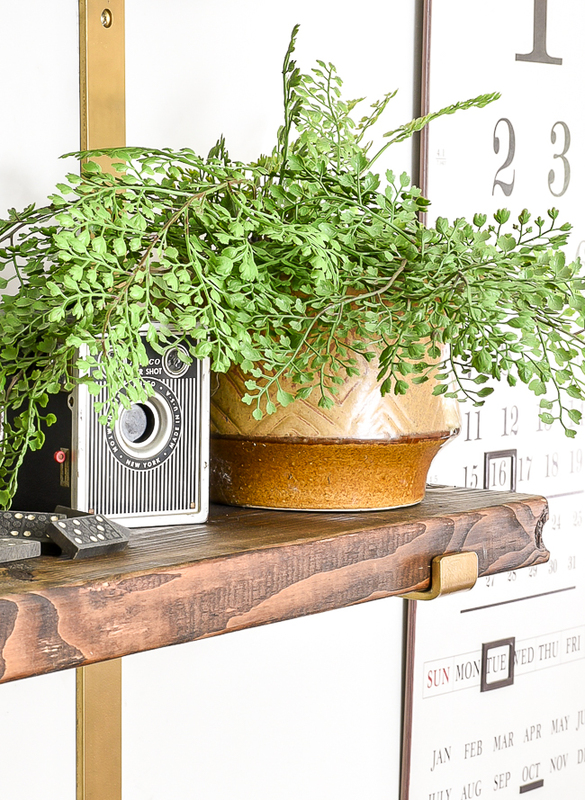 I've always loved the look of gold forged steel brackets and decided to use 10" ones to give me plenty of depth for decorating. I bought one 2 in. x 10 in. 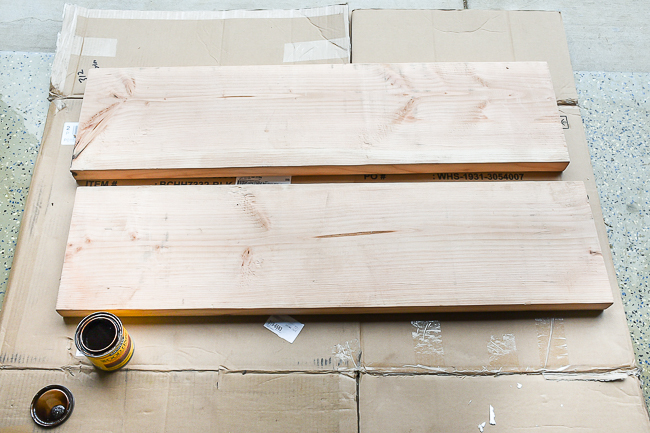 x 8 ft. board and cut it into two 3 foot lengths. 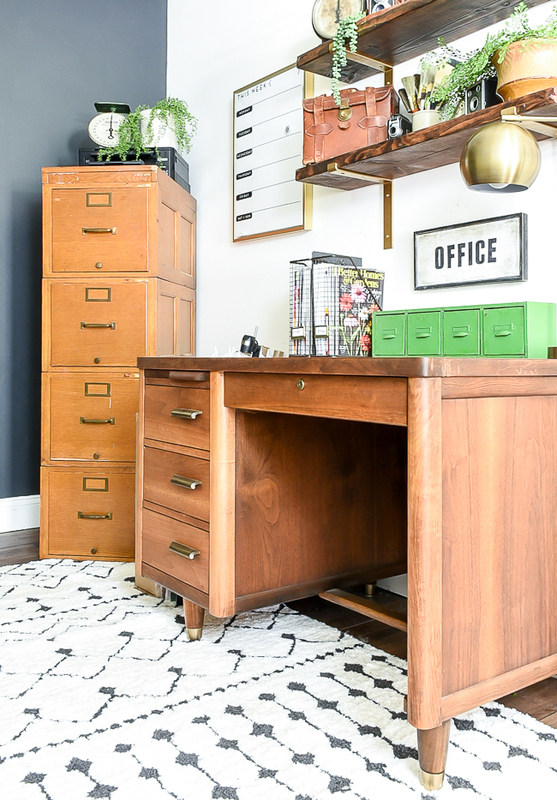 I used a combination of Minwax provincial and red oak stain to get a close match to the new to me mid-century desk. 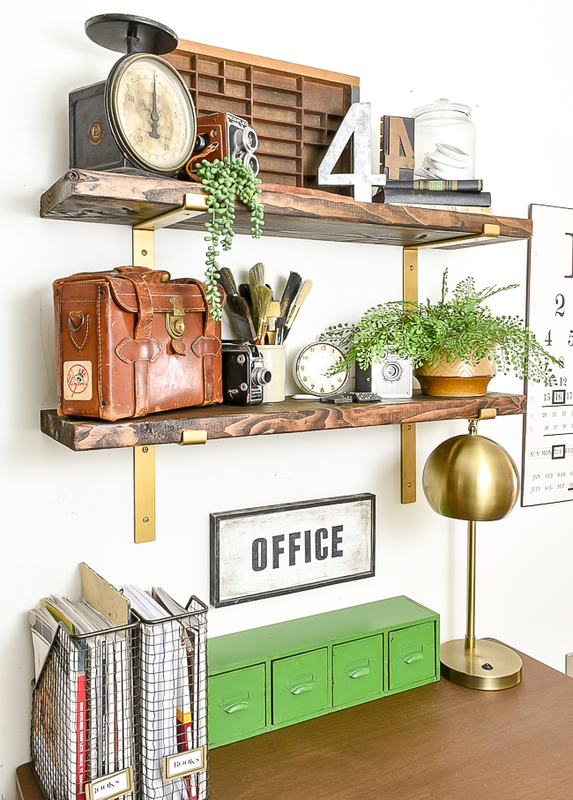 I hung the shelves with 8 screws and anchors then touched up the heads of the screws with Gold Leaf Rub 'n Buff to blend them into the gold brackets. 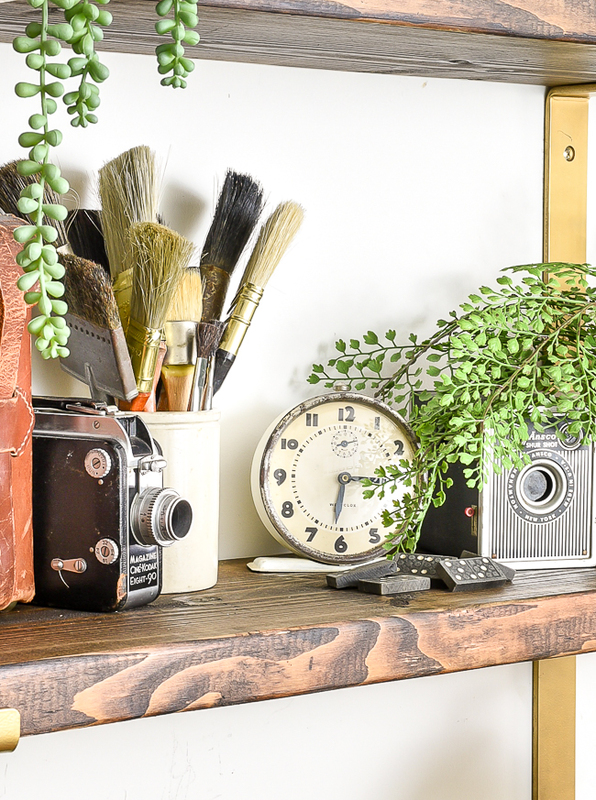 Once I got the shelves in place I started styling them with a few of my favorite vintage finds. 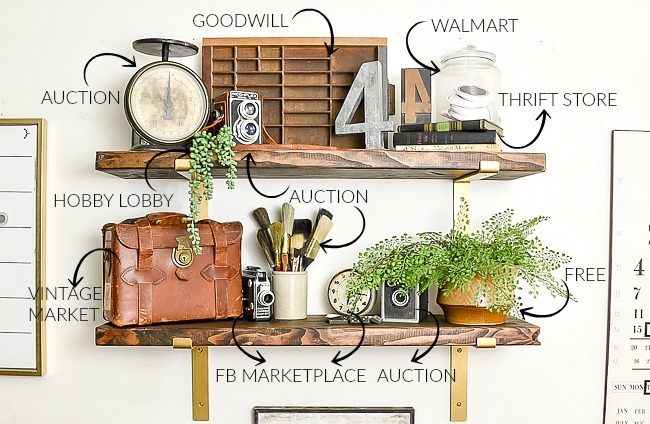 Most of these items were found from thrift stores and auctions and I love that I can easily rotate decor. 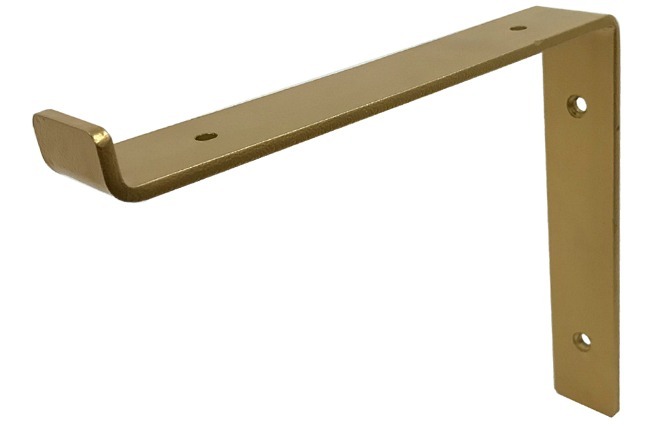 My favorite part of the new desk are the awesome original brass pulls. It also has amazing dividers built into the drawers, which are perfect for organizing. 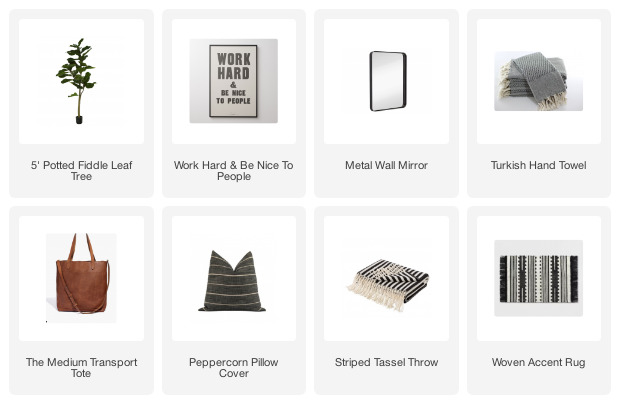 I bought a new rug from boutique rugs and to add a pop of color, I snagged the green pillow from our room and the green metal storage drawers from Owen's room. I still have the lockers on the other side of the room as well as the set of five vintage theatre chairs. My office is now a place that I love to spend time. 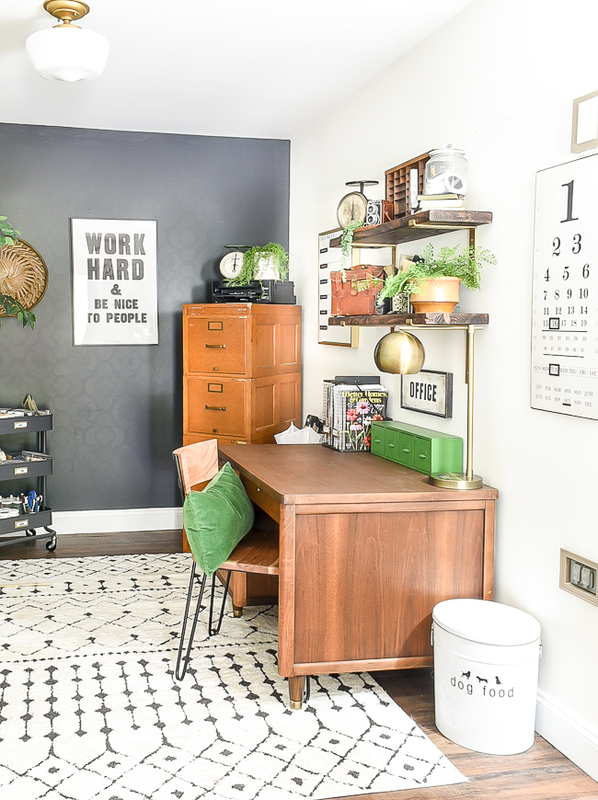 It includes so many of my favorite colors and decor and is the perfect place to work and be inspired. The majority of the furniture and decor was either free or found secondhand and reflects my style and what I love perfectly. It just goes to show that you don't have to spend a lot of money to create a space you love. 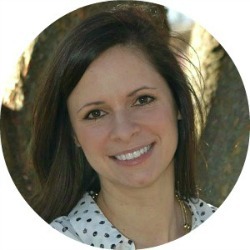 If you are interested in sources included in my office you can find them below. it looks so good in there! i love the pops of green! Oh I love it all. What a great office space. Thank you for all the info! It looks so great! Was your accent Iron Ore wall stenciled before it was painted?? I think my eyes are playing tricks on me, I see a design in it! Ha, your eyes are not playing tricks on you. 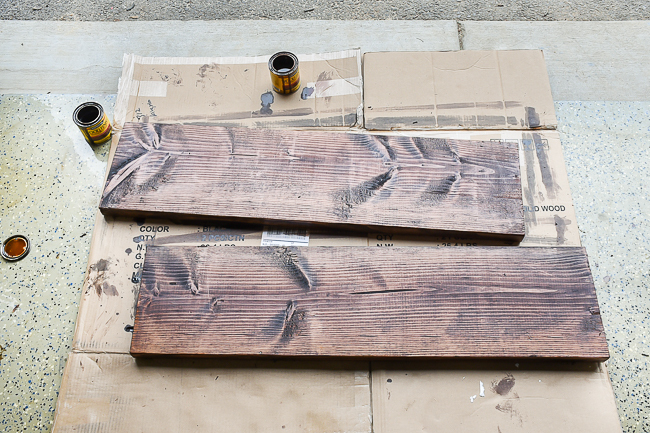 I did have the wall stenciled before painting over it with Iron Ore. I liked the thought of a subtle design, so I opted not to sand the wall before painting. Love what you did with the old dresser. I also like all the other treasures in your office. Gives me lots of ideas.